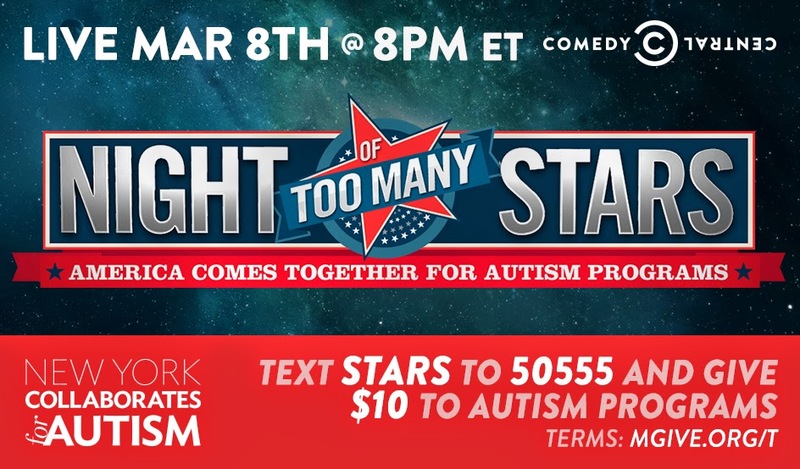 The Night of Too Many Stars is a biennial telethon that works together with New York Collaborates with Autism (NYCA) to raise money for autism schools, programs and services. Suzanne Wright is a member of the board of directors at NYCA. Well of course she is. She always has her fingers in the pie, doesn't she? This is a problem. I thought about it for days before I decided I would go ahead and support it. Why? Why would I support something that the Wrights are involved with when I just spent two weeks tweeting in protest of AutismSpeaks10? Because for one, I am realist. Autism Speaks has been around for a very long time. The Wrights are, I assume, millionaires and have long ties to the media. It will be near impossible to ever get anything done and not cross paths with them from time to time. They are working with Google, which I disagree with, but I still use my Gmail and Blogger account. Second, the money raised from this benefit goes to programs, schools and projects that helps #ActuallyAutistic people. They are doing a lot of good work, and showing that autistics are valuable members of society. They just need a few extra supports and therapies, sometimes. This is the polar opposite of the message Autism Speaks puts out, and I want to support it. The entire two hour show is non stop laughter and fun. No one is talking about the tragedy of autism. The NTMS website specifically says they are not looking for a cure, they only want to help the people in the here and now. "The only clinically proven treatment for autism is appropriate, intensive education"
This year's event raised over $4 million in just 2 hours. A.S. spends about $4.6 million in family services grants in a year. To me, $4 million going to real people who need it, is worth supporting. I feel like not supporting NTMS just because Ms. Wright has a minor role in the organization is a bit like throwing the baby out with the bathwater. I don't expect, neither am I asking for anyone to agree with me. I don't think it is necessary to agree with everyone on everything. In fact, I have people I follow who I disagree strongly with on many topics, but I still read what they say because it keeps me grounded to hear another side of a topic. And it gives me an opportunity to ask myself if I really feel the way I do, or am I just being swept along by whatever wave is flowing this week. I think this is a good exercise for everyone to engage in.